The Goldman Sachs Group, Inc., is an American multinational investment bank and financial services company headquartered in New York City. It offers services in investment management, securities, asset management, prime brokerage, and securities underwriting. Goldman Sachs Headquarters, at 200 West Street, in Manhattan. The bank is one of the largest investment banking enterprises in the world, and is a primary dealer in the United States Treasury security market and more generally, a prominent market maker. The bank also owns Goldman Sachs Bank USA, a direct bank. Goldman Sachs was founded in 1869 and is headquartered at 200 West Street in Lower Manhattan with additional offices in other international financial centers. As a result of its involvement in securitization during the subprime mortgage crisis, Goldman Sachs suffered during the 2007-2008 financial crisis, and received a $10 billion investment from the United States Department of the Treasury as part of the Troubled Asset Relief Program, a financial bailout created by the Emergency Economic Stabilization Act of 2008. The investment was made in November 2008 and was repaid in June 2009. Former employees of Goldman Sachs have moved on to government positions. Notable examples includes former U.S. Secretaries of the Treasury Robert Rubin and Henry Paulson; current United States Secretary of the Treasury Steven Mnuchin; former chief economic advisor Gary Cohn; European Central Bank President Mario Draghi; former Bank of Canada Governor and current Governor of the Bank of England Mark Carney and the former Prime Minister of Australia Malcolm Turnbull. In addition, former Goldman employees have headed the New York Stock Exchange, the World Bank, and competing banks such as Citigroup and Merrill Lynch. The company is ranked 70th on the Fortune 500 list of the largest United States corporations by total revenue. Goldman Sachs was founded in New York in 1869 by Marcus Goldman. In 1882, Goldman's son-in-law Samuel Sachs joined the firm. In 1885, Goldman took his son Henry and his son-in-law Ludwig Dreyfuss into the business and the firm adopted its present name, Goldman Sachs & Co. The company made a name for itself pioneering the use of commercial paper for entrepreneurs and joined the New York Stock Exchange (NYSE) in 1896. By 1898, the firm's capital stood at $1.6 million (about $48 million in real value), and was growing rapidly. Goldman entered the initial public offering market in 1906 when it took Sears, Roebuck and Company public. The deal occurred due to Henry Goldman's personal friendship with an owner of Sears, Julius Rosenwald. Other IPOs followed, including F. W. Woolworth and Continental Can. In 1912, Henry S. Bowers became the first non-member of the founding family to become partner of the company and share in its profits. In 1917, under growing pressure from the other partners in the firm due to his pro-German stance, Henry Goldman resigned. Control of the firm was now in the hands of the Sachs family. Waddill Catchings joined the company in 1918. In 1920, the firm moved from 60 Wall Street to $1.5 million 12-storey premises on 30-32 Pine Street. By 1928, Catchings was the Goldman partner with the single largest stake in the firm. On December 4, 1928, the firm launched the Goldman Sachs Trading Corp, a closed-end fund. The fund failed during the Stock Market Crash of 1929, amid accusations that Goldman had engaged in share price manipulation and insider trading. In 1930, the firm ousted Catchings, and Sidney Weinberg assumed the role of senior partner and shifted Goldman's focus away from trading and toward investment banking. It was Weinberg's actions that helped to restore some of Goldman's tarnished reputation. On the back of Weinberg, Goldman was lead advisor on the Ford Motor Company's IPO in 1956, which at the time was a major coup on Wall Street. Under Weinberg's reign the firm also started an investment research division and a municipal bond department. It also was at this time that the firm became an early innovator in risk arbitrage. Gus Levy joined the firm in the 1950s as a securities trader, which started a trend at Goldman where there would be two powers generally vying for supremacy, one from investment banking and one from securities trading. For most of the 1950s and 1960s, this would be Weinberg and Levy. Levy was a pioneer in block trading and the firm established this trend under his guidance. Due to Weinberg's heavy influence at the firm, it formed an investment banking division in 1956 in an attempt to spread around influence and not focus it all on Weinberg. In 1969, Levy took over as Senior Partner from Weinberg, and built Goldman's trading franchise once again. It is Levy who is credited with Goldman's famous philosophy of being "long-term greedy", which implied that as long as money is made over the long term, trading losses in the short term were not to be worried about. At the same time, partners reinvested almost all of their earnings in the firm, so the focus was always on the future. That same year, Weinberg retired from the firm. Another financial crisis for the firm occurred in 1970, when the Penn Central Transportation Company went bankrupt with over $80 million in commercial paper outstanding, most of it issued through Goldman Sachs. The bankruptcy was large, and the resulting lawsuits, notably by the SEC, threatened the partnership capital, life and reputation of the firm. It was this bankruptcy that resulted in credit ratings being created for every issuer of commercial paper today by several credit rating services. During the 1970s, the firm also expanded in several ways. Under the direction of Senior Partner Stanley R. Miller, it opened its first international office in London in 1970 and created a private wealth division along with a fixed income division in 1972. It also pioneered the "white knight" strategy in 1974 during its attempts to defend Electric Storage Battery against a hostile takeover bid from International Nickel and Goldman's rival Morgan Stanley. This action would boost the firm's reputation as an investment advisor because it pledged to no longer participate in hostile takeovers. John L. Weinberg (the son of Sidney Weinberg), and John C. Whitehead assumed roles of co-senior partners in 1976, once again emphasizing the co-leadership at the firm. One of their initiatives was the establishment of 14 business principles that the firm still claims to apply. On November 16, 1981, the firm acquired J. Aron & Company, a commodities trading firm which merged with the Fixed Income division to become known as Fixed Income, Currencies, and Commodities. J. Aron was a player in the coffee and gold markets, and the former CEO of Goldman, Lloyd Blankfein, joined the firm as a result of this merger. In 1985 it underwrote the public offering of the real estate investment trust that owned Rockefeller Center, then the largest REIT offering in history. In accordance with the beginning of the dissolution of the Soviet Union, the firm also became involved in facilitating the global privatization movement by advising companies that were spinning off from their parent governments. In 1986, the firm formed Goldman Sachs Asset Management, which manages the majority of its mutual funds and hedge funds today. In the same year, the firm also underwrote the IPO of Microsoft, advised General Electric on its acquisition of RCA and joined the London and Tokyo stock exchanges. 1986 also was the year when Goldman became the first United States bank to rank in the top 10 of mergers and acquisitions in the United Kingdom. During the 1980s the firm became the first bank to distribute its investment research electronically and created the first public offering of original issue deep-discount bond. Robert Rubin and Stephen Friedman assumed the Co-Senior Partnership in 1990 and pledged to focus on globalization of the firm and strengthening the Merger & Acquisition and Trading business lines. During their reign, the firm introduced paperless trading to the New York Stock Exchange and lead-managed the first-ever global debt offering by a U.S. corporation. It also launched the Goldman Sachs Commodity Index (GSCI) and opened a Beijing office in 1994. Also in 1994, Jon Corzine assumed leadership of the firm as CEO, following the departure of Rubin and Friedman. Another momentous event in Goldman's history was the Mexican bailout of 1995. Rubin drew criticism in Congress for using a Treasury Department account under his personal control to distribute $20 billion to bail out Mexican bonds, of which Goldman was a key distributor. On November 22, 1994, the Mexican Bolsa stock market had admitted Goldman Sachs and one other firm to operate on that market. The 1994 economic crisis in Mexico threatened to wipe out the value of Mexico's bonds held by Goldman Sachs. In 1994, Goldman financed Rockefeller Center in a deal that allowed it to take an ownership interest in 1996, and sold Rockefeller Center to Tishman Speyer in 2000. In April 1997, Goldman was lead underwriter of the Yahoo! IPO. In 1998 it was the co-lead manager of the 2 trillion yen NTT DoCoMo IPO. In 1999, Goldman acquired Hull Trading Company, one of the world's premier market-making firms, for $531 million. After decades of debate among the partners, the company became a public company via an initial public offering in May 1999. Goldman sold 12.6% of the company to the public, and, after the IPO, 48.3% of the company was held by the 221 former partners, 21.2% of the company was held by non-partner employees, and the remaining 17.9% was held by retired Goldman partners and two long-time investors, Sumitomo Bank Ltd. and Assn, the investing arm of Kamehameha Schools. The shares were priced at $53 each and, after the IPO, Henry Paulson became Chairman and Chief Executive Officer, succeeding Jon Corzine. Goldman Sachs purchased Spear, Leeds, & Kellogg, one of the largest specialist firms on the New York Stock Exchange, for $6.3 billion in September 2000. In January 2000, Goldman, along with Lehman Brothers, was the lead manager for the first internet bond offering for the World Bank. In 2003, the firm took a 45% stake in a joint venture with JBWere, the Australian investment bank. In December 2005, four years after its report on the emerging "BRIC" economies (Brazil, Russia, India, and China), Goldman Sachs named its "Next Eleven" list of countries, using macroeconomic stability, political maturity, openness of trade and investment policies and quality of education as criteria: Bangladesh, Egypt, Indonesia, Iran, Mexico, Nigeria, Pakistan, the Philippines, Turkey, South Korea and Vietnam. In May 2006, Paulson left the firm to serve as United States Secretary of the Treasury, and Lloyd C. Blankfein was promoted to Chairman and Chief Executive Officer. In January 2007, Goldman, along with CanWest Global Communications, acquired Alliance Atlantis, the company with the broadcast rights to the CSI franchise. During the 2007 Subprime mortgage crisis, Goldman was able to profit from the collapse in subprime mortgage bonds in the summer of 2007 by short-selling subprime mortgage-backed securities. Two Goldman traders, Michael Swenson and Josh Birnbaum, are credited with being responsible for the firm's large profits during the crisis. The pair, members of Goldman's structured products group in New York City, made a profit of $4 billion by "betting" on a collapse in the sub-prime market and shorting mortgage-related securities. By summer 2007, they persuaded colleagues to see their point of view and convinced skeptical risk management executives. The firm initially avoided large subprime writedowns and achieved a net profit due to significant losses on non-prime securitized loans being offset by gains on short mortgage positions. The firm's viability was later called into question as the crisis intensified in September 2008. So let's reduce this macro story to human scale. Meet GSAMP Trust 2006-S3, a $494 million drop in the junk-mortgage bucket, part of the more than half-a-trillion dollars of mortgage-backed securities issued last year. We found this issue by asking mortgage mavens to pick the worst deal they knew of that had been floated by a top-tier firm - and this one's pretty bad. It was sold by Goldman Sachs - GSAMP originally stood for Goldman Sachs Alternative Mortgage Products but now has become a name itself, like AT&T and 3M. This issue, which is backed by ultra-risky second-mortgage loans, contains all the elements that facilitated the housing bubble and bust. It's got speculators searching for quick gains in hot housing markets; it's got loans that seem to have been made with little or no serious analysis by lenders; and finally, it's got Wall Street, which churned out mortgage "product" because buyers wanted it. As they say on the Street, "When the ducks quack, feed them." On September 21, 2008, Goldman Sachs and Morgan Stanley, the last two major investment banks in the United States, both confirmed that they would become traditional bank holding companies. The Federal Reserve's approval of their bid to become banks ended the business model of an independent securities firm, 75 years after Congress separated them from deposit-taking lenders, and capped weeks of chaos that sent Lehman Brothers into bankruptcy and led to the rushed sale of Merrill Lynch & Co. to Bank of America Corp. On September 23, 2008, Berkshire Hathaway agreed to purchase $5 billion in Goldman's preferred stock, and also received warrants to buy another $5 billion in Goldman's common stock within 5 years. The company also raised $5 billion via a public offering of shares at $123 per share. Goldman also received a $10 billion preferred stock investment from the U.S. Treasury in October 2008, as part of the Troubled Asset Relief Program (TARP). Andrew Cuomo, then New York Attorney General, questioned Goldman's decision to pay 953 employees bonuses of at least $1 million each after it received TARP funds in 2008. That same period, however, CEO Lloyd Blankfein and 6 other senior executives opted to forgo bonuses, stating they believed it was the right thing to do, in light of "the fact that we are part of an industry that's directly associated with the ongoing economic distress". Cuomo called the move "appropriate and prudent", and urged the executives of other banks to follow the firm's lead and refuse bonus payments. In June 2009, Goldman Sachs repaid the U.S. Treasury's TARP investment, with 23% interest (in the form of $318 million in preferred dividend payments and $1.418 billion in warrant redemptions). On March 18, 2011, Goldman Sachs acquired Federal Reserve approval to buy back Berkshire's preferred stock in Goldman. In December 2009, Goldman announced that its top 30 executives will be paid year-end bonuses in restricted stock that they cannot sell for 5 years, with clawback provisions. During the 2008 Financial Crisis, the Federal Reserve introduced a number of short-term credit and liquidity facilities to help stabilize markets. Some of the transactions under these facilities provided liquidity to institutions whose disorderly failure could have severely stressed an already fragile financial system. Goldman Sachs was one of the heaviest users of these loan facilities, taking out many loans between March 18, 2008 and April 22, 2009. The Primary Dealer Credit Facility (PDCF), the first Fed facility ever to provide overnight loans to investment banks, loaned Goldman Sachs a total of $589 billion against collateral such as corporate market instruments and mortgage-backed securities. The Term Securities Lending Facility (TSLF), which allows primary dealers to borrow liquid Treasury securities for one month in exchange for less liquid collateral, loaned Goldman Sachs a total of $193 billion. Goldman Sachs's borrowings totaled $782 billion in hundreds of revolving transactions over these months. The loans were fully repaid in accordance with the terms of the facilities. According to a 2009 BrandAsset Valuator survey taken of 17,000 people nationwide, the firm's reputation suffered in 2008 and 2009, and rival Morgan Stanley was respected more than Goldman Sachs, a reversal of the sentiment in 2006. Goldman refused to comment on the findings. In 2011, Goldman took full control of JBWere in a $1 billion buyout. In 2011, Goldman Sachs shut down the Global Alpha fund, once the firm's largest hedge funds. The announcement followed a reported decline in fund balances to less than $1.7 billion in June 2011 from $11 billion in 2007. The decline was caused by investors withdrawing from the fund following earlier substantial market losses. Global Alpha was at one point one of the largest hedge funds in the world, with over $12 billion under management. It was started in 1995 with $10 million. In September 2013, Goldman Sachs Asset Management announced it had entered into an agreement with Deutsche Asset & Wealth Management to acquire its stable value business, with total assets under supervision of $21.6 billion as of June 30, 2013[update]. In April 2013, together with Deutsche Bank, Goldman led a $17 billion bond offering by Apple Inc., the largest corporate-bond deal in history and Apple's first since 1996. Goldman Sachs managed both of Apple's previous bond offerings in the 1990s. Goldman Sachs was the lead underwriter for Twitter's initial public offering in 2013. At the time, Goldman's position as lead underwriter for Twitter was considered "one of the biggest tech prizes around". Goldman earned approximately $22.8 million in fees from the Twitter IPO; however, the chief economist and strategist at ZT Wealth said, "Goldman being the first name on the S-1 has little to do with fees. This is about Goldman rebalancing itself as a serious leader and competing with Morgan Stanley's dominant position in technology." In 2013, Goldman underwrote the $2.913 billion Grand Parkway System Toll Revenue Bond offering for the Houston, Texas area, one of the fastest growing areas in the United States. The bond will be repaid from toll revenue. In June 2013, Goldman Sachs purchased loan portfolio from Brisbane-based Suncorp Group, one of Australia's largest banks and insurance companies. The A$1.6 billion face amount loan portfolio was purchased for A$960 million. On October 30, 2014, Goldman Sachs filed a patent application for a virtual currency called SETLCoin. In August 2015, Goldman Sachs agreed to acquire General Electric Co.'s GE Capital Bank on-line deposit platform. Terms of the transaction were not disclosed, but the purchase includes US$8-billion of on-line deposits and another US$8-billion of brokered certificates of deposit. The purchase allows Goldman Sachs to access a stable and inexpensive pool of source of funding. In April 2016, Goldman Sachs launched a direct bank, GS Bank. In October 2016, Goldman Sachs Bank USA started offering no-fee personal loans under the brand Marcus by Goldman Sachs. In March 2016, Goldman Sachs agreed to acquire financial technology startup Honest Dollar, a digital retirement savings tool founded by American entrepreneur whurley, focused on helping small-business employees and self-employed workers obtain affordable retirement plans. Terms of the deal were not disclosed. In May 2017, Goldman Sachs purchased $2.8 billion of PdVSA 2022 bonds from the Central Bank of Venezuela during the 2017 Venezuelan protests. In April 2018, Goldman Sachs bought Clarity Money, a personal finance startup, to be added to its Marcus by Goldman Sachs roster. This acquisition is expected to add over 1 million customers to the Marcus business. In 2015, investment banking accounted for 21% of total company revenues. Investment banking includes financial advisory (mergers and acquisitions, investitures, corporate defense activities, restructuring, and spin-offs) and underwriting (capital raises, public offerings, and private placements of equity and debt instruments). Goldman Sachs is one of the leading M&A advisory firms, often topping the Thomson Financial league tables in sizes of transactions. The firm gained a reputation as a white knight in the mergers and acquisitions sector by advising clients on how to avoid unfriendly hostile takeovers. During the 1980s, Goldman Sachs was the only major investment bank with a strict policy against helping to initiate a hostile takeover, which increased the firm's reputation immensely among sitting management teams at the time. In 2015, investing and lending accounted for 16% of total company revenues. In 2017, Institutional Client Services accounted for 37% of revenues. The segment is divided into four divisions and includes Fixed Income (the trading of interest rate and credit products, mortgage-backed securities, insurance-linked securities and structured and derivative products), Currency and Commodities (the trading of currencies and commodities), Equities (the trading of equities, equity derivatives, structured products, options, and futures contracts), and Principal Investments (merchant banking investments and funds). This segment consists of the revenues and profit gained from the Bank's trading activities, both on behalf of its clients (known as flow trading) and for its own account (known as proprietary trading). In 2015, investment management accounted for 18% of total company revenues. The Investment Management division provides investment advisory and financial planning services and offers investment products (primarily through separately managed accounts and commingled vehicles) across all major asset classes to a diverse group of institutions and individuals worldwide. The division provides clearing, financing, custody, securities lending, and reporting services to institutional clients, including hedge funds, mutual funds, and pension funds. The division generates revenues primarily in the form of spreads, or management and transaction fees. GS Capital Partners is the private equity arm of Goldman Sachs that invests on behalf of institutional clients. It has invested over $17 billion in the 20 years from 1986 to 2006. One of the most prominent funds is the GS Capital Partners V fund, which raised over $8.5 billion for investment. On April 23, 2007, Goldman closed new investment in GS Capital Partners VI with $20 billion in committed capital, including $11 billion from qualified institutional and high-net-worth clients and $9 billion from Goldman Sachs and its employees. In 2016, the company announced it will raise up to $8 billion for a new fund focused on corporate buyouts, its first new fund since the financial crisis of 2007-2008. The company offers a donor advised fund (DAF) called Goldman Sachs Gives that donates to charitable organizations with an employee donation match of up to $20,000. A 2019 investigation of by Sludge of DAFs and hate groups found that Goldman Sach's donor advised fund had not been used to fund any SPLC hate groups, but that the fund did not have any explicit policy preventing such donations. Goldman has been accused of an assortment of misdeeds, including a general decline in ethical standards, working with dictatorial regimes, cozy relationships with the US federal government via a "revolving door" of former employees, insider trading by some of its traders, and driving up prices of commodities through futures speculation. Goldman has denied wrongdoing in these cases. For the first time in 2018, a new Securities and Exchange Commission rule mandated under the 2010 Dodd-Frank financial reform requires publicly traded companies to disclose how their CEOs are compensated in comparison with their employees. In public filings, companies have to disclose their “Pay Ratios,” or the CEO's compensation divided by the median employee's. According to SEC filings, The Goldman Sachs Group Inc. paid its CEO $21,995,266 in 2017. The average worker employed by The Goldman Sachs Group Inc. was paid $135,165 in 2017; thus marking a CEO-to-worker Pay Ratio of 163 to 1.As of April 2018[update], steelmaker Nucor represented the median CEO-to-worker Pay Ratio from SEC filings with values of 133 to 1. Bloomberg BusinessWeek on May 2, 2013 found the ratio of CEO pay to the typical worker rose from about 20-to-1 in the 1950s to 120-to-1 in 2000. Goldman has been criticized in the aftermath of the financial crisis of 2007–2008, where some alleged that it misled its investors and profited from the collapse of the mortgage market. That time in Goldman's history brought investigations from the United States Congress, the United States Department of Justice, and a lawsuit from the U.S. Securities and Exchange Commission that resulted in Goldman paying a $550 million settlement. Goldman Sachs was "excoriated by the press and the public" despite the non-retail nature of its business that would normally have kept it out of the public eye. Visibility and antagonism came from the $12.9 billion Goldman received, more than any other firm, from AIG counterparty payments provided by the bailout of AIG, the $10 billion in TARP money it received from the government (though the firm paid this back to the government), and a record $11.4 billion set aside for employee bonuses in the first half of 2009. While all the investment banks were scolded by congressional investigations, Goldman Sachs was subject to "a solo hearing in front of the Senate Permanent Subcommitee on Investigations" and a quite critical report. In a widely publicized story in Rolling Stone, Matt Taibbi characterized Goldman Sachs as a "great vampire squid" sucking money instead of blood, allegedly engineering "every major market manipulation since the Great Depression ... from tech stocks to high gas prices"
In June 2009, after the firm repaid the TARP investment from the U.S. Treasury, Goldman made some of the largest bonus payments in its history due to its strong financial performance. Andrew Cuomo, then New York Attorney General, questioned Goldman's decision to pay 953 employees bonuses of at least $1 million each after it received TARP funds in 2008. That same period, however, CEO Lloyd Blankfein and 6 other senior executives opted to forgo bonuses, stating they believed it was the right thing to do, in light of "the fact that we are part of an industry that's directly associated with the ongoing economic distress". Goldman Sachs maintained that its net exposure to AIG was 'not material', and that the firm was protected by hedges (in the form of CDSs with other counterparties) and $7.5 billion of collateral. The firm stated the cost of these hedges to be over $100 million. According to Goldman, both the collateral and CDSs would have protected the bank from incurring an economic loss in the event of an AIG bankruptcy (however, because AIG was bailed out and not allowed to fail, these hedges did not pay out). CFO David Viniar stated that profits related to AIG in the first quarter of 2009 "rounded to zero", and profits in December were not significant. He went on to say that he was "mystified" by the interest the government and investors have shown in the bank's trading relationship with AIG. Some have said, incorrectly according to others, that Goldman Sachs received preferential treatment from the government by being the only Wall Street firm to have participated in the crucial September meetings at the New York Fed, which decided AIG's fate. Much of this has stemmed from an inaccurate but often quoted New York Times article. The article was later corrected to state that Blankfein, CEO of Goldman Sachs, was "one of the Wall Street chief executives at the meeting" (emphasis added). Bloomberg has also reported that representatives from other firms were indeed present at the September AIG meetings. Furthermore, Goldman Sachs CFO David Viniar stated that CEO Blankfein had never "met" with his predecessor and then-US Treasury Secretary Henry Paulson to discuss AIG; However, there were frequent phone calls between the two of them. Paulson was not present at the September meetings at the New York Fed. Morgan Stanley was hired by the Federal Reserve to advise on the AIG bailout. In 2000, Goldman Sachs advised Dragon Systems on its sale to Lernout & Hauspie of Belgium for $580 million in L&H stock. L&H later collapsed due to accounting fraud and its stock price declined significantly. Jim and Janet Baker, founders and together 50% owners of Dragon, filed a lawsuit against Goldman Sachs, alleging negligence, intentional and negligent misrepresentation, and breach of fiduciary duty since Goldman did not warn Dragon or the Bakers of the accounting problems of the acquirer, L&H. On January 23, 2013 a federal jury rejected the Bakers' claims and found Goldman Sachs not liable to the Bakers. Goldman Sachs was charged for repeatedly issuing research reports with extremely inflated financial projections for Exodus Communications and Goldman Sachs was accused of giving Exodus its highest stock rating even though Goldman knew Exodus did not deserve such a rating. On July 15, 2003, Goldman Sachs, Lehman Brothers and Morgan Stanley were sued for artificially inflating the stock price of RSL Communications by issuing untrue or materially misleading statements in research analyst reports, and paid $3,380,000 for settlement. Goldman Sachs is accused of asking for kickback bribes from institutional clients who made large profits flipping stocks which Goldman had intentionally undervalued in initial public offerings it was underwriting. Documents under seal in a decade-long lawsuit concerning eToys.com's initial public offering (IPO) in 1999 but released accidentally to the New York Times show that IPOs managed by Goldman were underpriced and that Goldman asked clients able to profit from the prices to increase business with it. The clients willingly complied with these demands because they understood it was necessary in order to participate in further such undervalued IPOs. Companies going public and their initial consumer stockholders are both defrauded by this practice. A 2016 report by Citizens for Tax Justice stated that "Goldman Sachs reports having 987 subsidiaries in offshore tax havens, 537 of which are in the Cayman Islands, despite not operating a single legitimate office in that country, according to its own website. The group officially holds $28.6 billion offshore." The report also noted several other major U.S. banks and companies use the same tax-avoidance tactics. In 2008, Goldman Sachs had an effective tax rate of only 1%, down from 34% the year before, and its tax liability decreased to $14 million in 2008, compared to $6 billion in 2007. Critics have argued that the reduction in Goldman Sachs's tax rate was achieved by shifting its earnings to subsidiaries in low or no-tax nations, such as the Cayman Islands. Goldman is being criticized for its involvement in the 2010 European sovereign debt crisis. Goldman Sachs is reported to have systematically helped the Greek government mask the true facts concerning its national debt between the years 1998 and 2009. In September 2009, Goldman Sachs, among others, created a special credit default swap (CDS) index to cover the high risk of Greece's national debt. The interest-rates of Greek national bonds soared, leading the Greek economy very close to bankruptcy in 2010 and 2011. Ties between Goldman Sachs and European leadership positions were another source of controversy. Lucas Papademos, Greece's former prime minister, ran the Central Bank of Greece at the time of the controversial derivatives deals with Goldman Sachs that enabled Greece to hide the size of its debt. Petros Christodoulou, General Manager of the Greek Public Debt Management Agency is a former employee of Goldman Sachs. Mario Monti, Italy's former prime minister and finance minister, who headed the new government that took over after Berlusconi's resignation, is an international adviser to Goldman Sachs. Otmar Issing, former board member of the Bundesbank and the Executive Board of the European Bank also advised Goldman Sachs. Mario Draghi, head of the European Central Bank, is the former managing director of Goldman Sachs International. António Borges, Head of the European Department of the International Monetary Fund in 2010-2011 and responsible for most of enterprise privatizations in Portugal since 2011, is the former Vice Chairman of Goldman Sachs International. Carlos Moedas, a former Goldman Sachs employee, was the Secretary of State to the Prime Minister of Portugal and Director of ESAME, the agency created to monitor and control the implementation of the structural reforms agreed by the government of Portugal and the troika composed of the European Commission, the European Central Bank and the International Monetary Fund. Peter Sutherland, former Attorney General of Ireland was a non-executive director of Goldman Sachs International. In March 2012, Greg Smith, then-head of Goldman Sachs US equity derivatives sales business in Europe, the Middle East and Africa (EMEA), resigned his position via a critical letter printed as an op-ed in The New York Times. In the letter, he attacked Goldman Sachs CEO and Chairman Lloyd Blankfein for losing touch with the company's culture, which he described as "the secret sauce that made this place great and allowed us to earn our clients' trust for 143 years". Smith said that advising clients "to do what I believe is right for them" was becoming increasingly unpopular. Instead there was a "toxic and destructive" environment in which "the interests of the client continue to be sidelined", senior management described clients as "muppets" and colleagues callously talked about "ripping their clients off". In reply, Goldman Sachs said that "we will only be successful if our clients are successful", claiming "this fundamental truth lies at the heart of how we conduct ourselves", and that "we don't think [Smith's comments] reflect the way we run our business". Later that year, Smith published a book titled Why I left Goldman Sachs. According to research by The New York Times after the op-ed was printed, almost all the claims made in Smith's incendiary Op-Ed about Goldman Sachs turned out to be "curiously short" on evidence. The New York Times never issued a retraction or admitted to any error in judgment in initially publishing Smith's op-ed. In 2014 a book by former Goldman portfolio manager Steven George Mandis was published entitled What Happened to Goldman Sachs: An Insider's Story of Organizational Drift and Its Unintended Consequences. Mandis also has a PhD dissertation about Goldman at Columbia University. Mandis left in 2004 after working for the firm for 12 years. In an interview, Mandis said, "You read about Goldman Sachs, and it's either the bank is the best or the bank is the worst, this is not one of those books - things are never black or white." According to Mandis, there was an "organizational drift" in the company's evolution. In 2010, two former female employees filed a lawsuit against Goldman Sachs for gender discrimination. Cristina Chen-Oster and Shanna Orlich claimed that the firm fostered an "uncorrected culture of sexual harassment and assault" causing women to either be "sexualized or ignored". The suit cited both cultural and pay discrimination including frequent client trips to strip clubs, client golf outings that excluded female employees, and the fact that female vice presidents made 21% less than their male counterparts. In March 2018, the judge ruled that the female employees may pursue their claims as a group in a class-action lawsuit against Goldman on gender bias, but the class action excludes their claim on sexual harassment. On November 11, 2008, the Los Angeles Times reported that Goldman Sachs had both earned $25 million from underwriting California bonds, and advised other clients to short those bonds. While some journalists criticized the contradictory actions, others pointed out that the opposite investment decisions undertaken by the underwriting side and the trading side of the bank were normal and in line with regulations regarding Chinese walls, and in fact critics had demanded increased independence between underwriting and trading. During 2008 Goldman Sachs received criticism for an apparent revolving door relationship, in which its employees and consultants have moved in and out of high level U.S. Government positions, creating the potential for conflicts of interest. The large number of former Goldman Sachs employees in the US government has been jokingly referred to "Government Sachs". Former Treasury Secretary Paulson is a former CEO of Goldman Sachs. Additional controversy attended the selection of former Goldman Sachs lobbyist Mark A. Patterson as chief of staff to Treasury Secretary Timothy Geithner, despite President Barack Obama's campaign promise that he would limit the influence of lobbyists in his administration. In February 2011, the Washington Examiner reported that Goldman Sachs was "the company from which Obama raised the most money in 2008", and that its "CEO Lloyd Blankfein has visited the White House 10 times". In 1986, Goldman Sachs investment banker David Brown pleaded guilty to charges of passing inside information on a takeover deal that eventually was provided to Ivan Boesky. In 1989, Robert M. Freeman, who was a senior Partner, who was the Head of Risk Arbitrage, and who was a protégé of Robert Rubin, pleaded guilty to insider trading, for his own account and for the firm's account. In April 2010, Goldman director Rajat Gupta was named in an insider-trading case. It was said Gupta had "tipped off a hedge-fund billionaire", Raj Rajaratnam of Galleon Group, about the $5 billion Berkshire Hathaway investment in Goldman during the financial crisis of 2007-2008. According to the report, Gupta had told Goldman the month before his involvement became public that he wouldn't seek re-election as a director. In early 2011, with the delayed Rajaratnam criminal trial about to begin, the United States Securities and Exchange Commission (SEC) announced civil charges against Gupta covering the Berkshire investment as well as confidential quarterly earnings information from Goldman and Procter & Gamble (P&G). Gupta was board member at P&G until voluntarily resigning the day of the SEC announcement, after the charges were announced. "Gupta was an investor in some of the Galleon hedge funds when he passed the information along, and he had other business interests with Rajaratnam that were potentially lucrative.... Rajaratnam used the information from Gupta to illegally profit in hedge fund trades.... The information on Goldman made Rajaratnam's funds $17 million richer.... The Procter & Gamble data created illegal profits of more than $570,000 for Galleon funds managed by others, the SEC said." Gupta was said to have "vigorously denied the SEC accusations". He was also a board member of AMR Corporation. Gupta was convicted in June 2012 on insider trading charges stemming from Galleon Group case on four criminal felony counts of conspiracy and securities fraud. He was sentenced in October 2012 to two years in prison, an additional year on supervised release and ordered to pay $5 million in fines. The investments were called synthetic CDOs because unlike regular collateralized debt obligations, the principal and interest they paid out came not from mortgages or other loans, but from premiums to pay for insurance against mortgage defaults - the insurance known as "credit default swaps". Goldman and some other hedge funds held a "short" position in the securities, paying the premiums, while the investors (insurance companies, pension funds, etc.) receiving the premiums were the "long" position. The longs were responsible for paying the insurance "claim" to Goldman and any other shorts if the mortgages or other loans defaulted. Through April 2007 Goldman issued over 20 CDOs in its "Abacus" series worth a total of $10.9 billion. All together Goldman packaged, sold, and shorted a total of 47 synthetic CDOs, with an aggregate face value of $66 billion between July 1, 2004 and May 31, 2007. But while Goldman was praised for its foresight, some argued its bets against the securities it created gave it a vested interest in their failure. These securities performed very poorly for the long investors and by April 2010, at least US$5 billion worth of the securities either carried "junk" ratings, or had defaulted. One CDO examined by critics which Goldman bet against, but also sold to investors, was the $800 million Hudson Mezzanine CDO issued in 2006. In the Senate Permanent Subcommittee hearings, Goldman executives stated that the company was trying to remove subprime securities from its books. Unable to sell them directly, it included them in the underlying securities of the CDO and took the short side, but critics McLean and Nocera complained the CDO prospectus did not explain this but described its contents as "'assets sourced from the Street', making it sound as though Goldman randomly selected the securities, instead of specifically creating a hedge for its own book". The CDO did not perform well, and by March 2008 - just 18 months after its issue - so many borrowers had defaulted that holders of the security paid out "about US$310 million to Goldman and others who had bet against it". Goldman's head of European fixed-income sales lamented in an e-mail made public by the Senate Permanent Subcommittee on Investigations, the "real bad feeling across European sales about some of the trades we did with clients" who had invested in the CDO. "The damage this has done to our franchise is very significant." In April 2010, the U.S. Securities and Exchange Commission (SEC) charged Goldman Sachs and one of its vice-presidents, Fabrice Tourre, with securities fraud. The SEC alleged that Goldman had told buyers of a synthetic CDO, a type of investment, that the underlying assets in the investment had been picked by an independent CDO manager, ACA Management. In fact, Paulson & Co. a hedge fund that wanted to bet against the investment had played a "significant role" in the selection, and the package of securities turned out to become "one of the worst-performing mortgage deals of the housing crisis" because "less than a year after the deal was completed, 100% of the bonds selected for Abacus had been downgraded". The particular synthetic CDO that the SEC's 2010 fraud suit charged Goldman with misleading investors with was called Abacus 2007-AC1. Unlike many of the Abacus securities, 2007-AC1 did not have Goldman Sachs as a short seller, in fact, Goldman Sachs lost money on the deal. That position was taken by the customer (John Paulson) who hired Goldman to issue the security (according to the SEC's complaint). Paulson and his employees selected 90 BBB-rated mortgage bonds that they believed were most likely to lose value and so the best bet to buy insurance for. Paulson and the manager of the CDO, ACA Management, worked on the portfolio of 90 bonds to be insured (ACA allegedly unaware of Paulson's short position), coming to an agreement in late February 2007. Paulson paid Goldman approximately US$15 million for its work in the deal. Paulson ultimately made a US$1 billion profit from the short investments, the profits coming from the losses of the investors and their insurers. These were primarily IKB Deutsche Industriebank (US$150 million loss), and the investors and insurers of another US$900 million - ACA Financial Guaranty Corp, ABN AMRO, and the Royal Bank of Scotland. The SEC alleged that Goldman "materially misstated and omitted facts in disclosure documents" about the financial security, including the fact that it had "permitted a client that was betting against the mortgage market [the hedge fund manager Paulson & Co.] to heavily influence which mortgage securities to include in an investment portfolio, while telling other investors that the securities were selected by an independent, objective third party", ACA Management. The SEC further alleged that "Tourre also misled ACA into believing ... that Paulson's interests in the collateral section [sic] process were aligned with ACA's, when, in reality, Paulson's interests were sharply conflicting". In reply, Goldman issued a statement saying the SEC's charges were "unfounded in law and fact", and in later statements maintained that it had not structured the portfolio to lose money, that it had provided extensive disclosure to the long investors in the CDO, that it had lost $90 million, that ACA selected the portfolio without Goldman suggesting Paulson was to be a long investor, that it did not disclose the identities of a buyer to a seller, and vice versa, as it was not normal business practice for a market maker, and that ACA was itself the largest purchaser of the Abacus pool, investing US$951 million. Goldman also stated that any investor losses resulted from the overall negative performance of the entire sector, rather than from a particular security in the CDO. While some journalists and analysts have called these statements misleading, others believed Goldman's defense was strong and the SEC's case was weak. Some experts on securities law such as Duke University law professor James Cox, believed the suit had merit because Goldman was aware of the relevance of Paulson's involvement and took steps to downplay it. Others, including Wayne State University Law School law professor Peter Henning, noted that the major purchasers were sophisticated investors capable of accurately assessing the risks involved, even without knowledge of the part played by Paulson. Critics of Goldman Sachs point out that Paulson went to Goldman Sachs after being turned down for ethical reasons by another investment bank, Bear Stearns who he had asked to build a CDO. Ira Wagner, the head of Bear Stearns's CDO Group in 2007, told the Financial Crisis Inquiry Commission that having the short investors select the referenced collateral as a serious conflict of interest and the structure of the deal Paulson was proposing encouraged Paulson to pick the worst assets. Describing Bear Stearns's reasoning, one author compared the deal to "a bettor asking a football owner to bench a star quarterback to improve the odds of his wager against the team". Goldman claimed it lost $90 million, critics maintain it was simply unable (not due to a lack of trying) to shed its position before the underlying securities defaulted. Critics also question whether the deal was ethical, even if it was legal. Goldman had considerable advantages over its long customers. According to McLean and Nocera, there were dozens of securities being insured in the CDO - for example, another ABACUS - had 130 credits from several different mortgage originators, commercial mortgage-backed securities, debt from Sallie Mae, credit cards, etc. Goldman bought mortgages to create securities, which made it "far more likely than its clients to have early knowledge" that the housing bubble was deflating and the mortgage originators like New Century had begun to falsify documentation and sell mortgages to customers unable to pay the mortgage-holders back - which is why the fine print on at least one ABACUS prospectus warned long investors that the 'Protection Buyer' (Goldman) 'may have information, including material, non-public information' which it was not providing to the long investors. According to an article in the Houston Chronicle, critics also worried that Abacus might undermine the position of the US "as a safe harbor for the world's investors" and that "The involvement of European interests as losers in this allegedly fixed game has attracted the attention of that region's political leaders, most notably British Prime Minister Gordon Brown, who has accused Goldman of "moral bankruptcy". This is, in short, a big global story ... Is what Goldman Sachs did with its Abacus investment vehicle illegal? That will be for the courts to decide, ... But it doesn't take a judge and jury to conclude that, legalities aside, this was just wrong." On July 15, 2010, Goldman settled out of court, agreeing to pay the SEC and investors US$550 million, including $300 million to the U.S. government and $250 million to investors, one of the largest penalties ever paid by a Wall Street firm. In August 2013 Tourre was found liable on 6 of 7 counts by a federal jury. The company did not admit or deny wrongdoing, but did admit that its marketing materials for the investment "contained incomplete information", and agreed to change some of its business practices regarding mortgage investments. The 2010 Goldman settlement did not cover charges against Goldman vice president and salesman for ABACUS, Fabrice Tourre. Tourre unsuccessfully sought a dismissal of the suit, which then went to trial in 2013. On August 1, a federal jury found Tourre liable on six of seven counts, including that he misled investors about the mortgage deal. He was found not liable on the charge that he had deliberately made an untrue or misleading statement. A provision of the 1999 financial deregulation law, the Gramm-Leach-Bliley Act, allows commercial banks to enter into any business activity that is "complementary to a financial activity and does not pose a substantial risk to the safety or soundness of depository institutions or the financial system generally". In the years since the laws passing, Goldman Sachs and other investment banks (Morgan Stanley, JPMorgan Chase) have branched out into ownership of a wide variety of enterprises including raw materials, such as food products, zinc, copper, tin, nickel and, aluminum. Former Goldman Sachs trader Matthew Marshall Taylor was convicted of hiding $8.3 billion worth of unauthorized trades involving derivatives on the S&P 500 index by making "multiple false entries" into a Goldman trading system. When Goldman Sachs management uncovered the trades, Taylor was immediately fired. The trades cost the company $118 million, which Taylor was ordered to repay. In 2013, Taylor plead guilty to charges and was sentenced to 9 months in prison in addition to the monetary damages. Frederick Kaufman, a contributing editor of Harper's Magazine, argued in a 2010 article that Goldman's creation of the Goldman Sachs Commodity Index (now the S&P GSCI) helped passive investors such as pension funds, mutual funds and others engage in food price Speculation by betting on financial products based on the commodity index. These financial products disturbed the normal relationship between supply and demand, making prices more volatile and defeating the price stabilization mechanism of the futures exchange. A June 2010 article in The Economist defended commodity investors and oil index-tracking funds, citing a report by the Organisation for Economic Co-operation and Development that found that commodities without futures markets and ignored by index-tracking funds also saw price rises during the period. In a July 2013 article, David Kocieniewski, a journalist with The New York Times accused Goldman Sachs and other Wall Street firms of "capitalizing on loosened federal regulations" to manipulate "a variety of commodities markets", particularly aluminum, citing "financial records, regulatory documents, and interviews with people involved in the activities". After Goldman Sachs purchased aluminum warehousing company Metro International in 2010, the wait of warehouse customers for delivery of aluminum supplies to their factories - to make beer cans, home siding, and other products - went from an average of 6 weeks to more than 16 months, "according to industry records". "Aluminum industry analysts say that the lengthy delays at Metro International after Goldman took over are a major reason the premium on all aluminum sold in the spot market has doubled since 2010." The price increase has cost "American consumers more than $5 billion" from 2010 to 2013 according to former industry executives, analysts and consultants. The cause of this was alleged to be Goldman's ownership of a quarter of the national supply of aluminum - a million and a half tons - in network of 27 Metro International warehouses Goldman owns in Detroit, Michigan. To avoid hoarding and price manipulation, the London Metal Exchange requires that "at least 3,000 tons of that metal must be moved out each day". Goldman has dealt with this requirement by moving the aluminum - not to factories, but "from one warehouse to another" - according to the Times. In August 2013, Goldman Sachs was subpoenaed by the federal Commodity Futures Trading Commission as part of an investigation into complaints that Goldman-owned metals warehouses had "intentionally created delays and inflated the price of aluminum". In December 2013, it was announced that 26 cases accusing Goldman Sachs and JPMorgan Chase, the two investment banks' warehousing businesses, and the London Metal Exchange in various combinations - of violating U.S. anti-trust laws, would be assigned to United States District Court for the Southern District of New York Judge Katherine B. Forrest in Manhattan. According to Lydia DePillis of Wonkblog, when Goldman bought the warehouses it "started paying traders extra to bring their metal" to Goldman's warehouses "rather than anywhere else. The longer it stays, the more rent Goldman can charge, which is then passed on to the buyer in the form of a premium." The effect is "amplified" by another company, Glencore, which is "doing the same thing in its warehouse in Vlissingen". Michael DuVally, a spokesman for Goldman Sachs, said the cases are without merit. Columnist Matt Levine, writing for Bloomberg News, described the conspiracy theory as "pretty silly", but said that it was a rational outcome of an irrational and inefficient system which Goldman Sachs may not have properly understood. In December 2014, Goldman Sachs sold its aluminum warehousing business to Ruben Brothers. Investment banks, including Goldman, have also been accused of driving up the price of gasoline by speculating on the oil futures exchange. In August 2011, "confidential documents" were leaked "detailing the positions" in the oil futures market of several investment banks, including Goldman Sachs, Morgan Stanley, JPMorgan Chase, Deutsche Bank, and Barclays, just before the peak in gasoline prices in the summer of 2008. The presence of positions by investment banks on the market was significant for the fact that the banks have deep pockets, and so the means to significantly sway prices, and unlike traditional market participants, neither produced oil nor ever took physical possession of actual barrels of oil they bought and sold. Journalist Kate Sheppard of Mother Jones called it "a development that many say is artificially raising the price of crude". However, another source stated that, "Just before crude oil hit its record high in mid-2008, 15 of the world's largest banks were betting that prices would fall, according to private trading data..."
In April 2011, a couple of observers - Brad Johnson of the blog Climate Progress, founded by Joseph J. Romm, and Alain Sherter of CBS MoneyWatch - noted that Goldman Sachs was warning investors of a dangerous spike in the price of oil. Climate Progress quoted Goldman as warning "that the price of oil has grown out of control due to excessive speculation" in petroleum futures, and that "net speculative positions are four times as high as in June 2008", when the price of oil peaked. It stated that, "Goldman Sachs told its clients that it believed speculators like itself had artificially driven the price of oil at least $20 higher than supply and demand dictate." Sherter noted that Goldman's concern over speculation did not prevent it (along with other speculators) from lobbying against regulations by the Commodity Futures Trading Commission to establish "position limits", which would cap the number of futures contracts a trader can hold, and thus prevent speculation. and "by 2008, eight investment banks accounted for 32% of the total oil futures market". Goldman Sachs's purchase of an 18% stake in state-owned DONG Energy (now Ørsted A/S) - Denmark's largest electric utility - set off a "political crisis" in Denmark. The sale - approved in January 30, 2014 - sparked protest in the form of the resignation of six cabinet ministers and the withdrawal of a party (Socialist People's Party) from Prime Minister Helle Thorning-Schmidt's leftist governing coalition. According to Bloomberg Businessweek, "the role of Goldman in the deal struck a nerve with the Danish public, which is still suffering from the after-effects of the global financial crisis". Protesters in Copenhagen gathered around a banner "with a drawing of a vampire squid - the description of Goldman used by Matt Taibbi in Rolling Stone in 2009". Opponents expressed concern that Goldman would have some say in DONG's management, and that Goldman planned to manage its investment through "subsidiaries in Luxembourg, the Cayman Islands, and Delaware, which made Danes suspicious that the bank would shift earnings to tax havens". Goldman purchased the 18% stake in 2014 for 8 billion kroner and sold just over a 6% stake in 2017 for 6.5 billion kroner. In January 2014, the Libyan Investment Authority (LIA) filed a lawsuit against Goldman for $1 billion after the firm lost 98% of the $1.3 billion the LIA invested with Goldman in 2007. Goldman made more than $1 billion in derivatives trades with the LIA funds, which lost almost all their value but earned Goldman $350 million in profit. In court documents the firm has admitted to having used small gifts, occasional travel and an internship in order to gain access to Libya's sovereign wealth fund. In August 2014, Goldman dropped a bid to end the suit in a London court. In October 2016, after trial, the court entered a judgment in Goldman Sachs's favor. In January 2016, Goldman Sachs agreed to pay $15 million after it was found that a team of Goldman employees, between 2008 and 2013, "granted locates" by arranging to borrow securities to settle short sales without adequate review. However, U.S. regulation for short selling requires brokerages to enter an agreement to borrow securities on behalf of customers or to have "reasonable grounds" for believing that it can borrow the security before entering contracts to complete the sale. Additionally, Goldman Sachs gave "incomplete and unclear" responses to information requests from SEC compliance examiners in 2013 about the firm's securities lending practices. According to the Thomson Reuters league tables, Goldman Sachs was the most successful foreign investment bank in Malaysia from 2011-2013. In 2013, the bank had a 21% market share in Malaysia's investment banking segment, double that of its nearest rival, mostly due to business with the Malaysian sovereign wealth fund, 1Malaysia Development Berhad (1MDB). In 2015, U.S. prosecutors began examining the role of Goldman in helping 1MDB raise more than $6 billion. The 1MDB bond deals were said to generate "above-average" commission and fees for Goldman amounting close to $600 million or more than 9% of the proceeds. Beginning in 2016, Goldman was investigated for a $3 billion bond created by the bank for 1MDB. Prosecutors investigated if the bank failed to comply with the U.S. Bank Secrecy Act, which requires financial institutions to report suspicious transactions to regulators. In November 2018, Goldman's former chairman of Southeast Asia, Tim Leissner, admitted that more than US$200 million in proceeds from 1MDB bonds went into the accounts controlled by him and a relative. Leissner and another former Goldman banker Roger Ng together with Malaysian financier Jho Low were charged with money laundering. Goldman chief executive David Solomon felt "horrible" about the ex-staff breaking the law by going around the policies and apologized to Malaysians for Leissner’s role in the 1MDB scandal. On December 17, 2018, Malaysia filed criminal charges against subsidiaries of Goldman and their former employees Tim Leissner and Roger Ng, alleging their commission of misleading statements in order to dishonestly misappropriate US$2.7 billion from the proceeds of 1MDB bonds arranged and underwritten by Goldman in 2012 and 2013. In March 2019 Goldman Sachs was fined £34.4m by the City regulator for misreporting millions of transactions over a decade. Goldman Sachs employees have donated to both major American political parties, as well as candidates and super PACs belonging to both parties. According to the Center for Responsive Politics, Goldman Sachs and its employees collectively gave $4.7 million in the 2014 elections to various candidates, leadership PACs, political parties, 527 groups, and outside spending entities. In the 2016 election cycle, Goldman employees were reported (as of September 2016[update]) to have donated $371,245 to the Republican National Committee and $301,119 to the Hillary Clinton presidential campaign. Goldman Sachs forbade its top level employees from donating to the Donald Trump presidential campaign. In 2010, the Securities and Exchange Commission issued regulations that limit asset managers' donations to state and local officials, and prohibit certain top-level employees from donating to such officials. This SEC regulation is an anti-"pay-to-play" measure, intended to avoid the creation of a conflict of interest, or the appearance of a conflict of interest, as Goldman Sachs has business in managing state pension funds and municipal debt. In 2016, Goldman Sachs's compliance department barred the firm's 450 partners (its most senior employees) from making donations to state or local officials, as well as "any federal candidate who is a sitting state or local official". One effect of this rule was to bar Goldman partners from directly donating to Donald Trump's presidential campaign, since Trump's running mate, Mike Pence, was the sitting governor of Indiana. Donations to Hillary Clinton's presidential campaign were not barred by the policy, since neither Clinton nor her running mate Tim Kaine were sitting state or local officials. 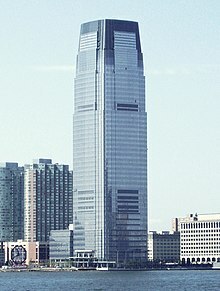 Goldman Sachs Tower at 30 Hudson Street in Jersey City. The company has been on Fortune Magazine's 100 Best Companies to Work For list since the list was launched in 1998, with emphasis placed on its support for employee philanthropic efforts and high employee compensation levels. In the first 3 months of 2016, the average total compensation per employee was $72,931 for the 3 months, 44% below the same period in 2015. The average total compensation per employee for the full year of 2006 was $622,000. The average compensation in the first three months of 2013 was $135,594. However, these numbers represent the arithmetic mean of total compensation and is highly skewed upwards as several hundred of the top recipients command the majority of the Bonus Pools, leaving the median that most employees receive well below this number. In Business Week's September 2008 release of the Best Places to Launch a Career, Goldman Sachs was ranked No.4 out of 119 total companies on the list. It was ranked #62 on the list of best places to work by Fortune Magazine in 2017. CEO Blankfein received a $67.9 million bonus in 2007, his first year. He chose to receive "some" cash unlike his predecessor, Paulson, who chose to take his bonus entirely in company stock. In 2011, the bank had near 11,000 more staffers than it did in 2005, but performances of workers drastically declined. In 2011, Goldman's 33,300 employees generated $28.8 billion in revenue and $2.5 billion in profit, but it represented a 25% decline in revenue per worker and a 71% decline in profit per worker compared with 2005. In 2011, the company reduced its workforce by 2,400 positions. Notable members currently on the board of directors of the company are M. Michele Burns, William W. George, James A. Johnson, Ellen J. Kullman, Lakshmi Mittal, Adebayo Ogunlesi, Peter Oppenheimer, Debora Spar, Mark Tucker, and David Viniar. Directors receive annual compensation of $600,000. In 1957, the company's headquarters was relocated to 20 Broad Street, New York City. Goldman Sachs's global headquarters is now at 200 West Street, New York City, and the company has major offices and regional headquarters in London, Bangalore, Hong Kong, Tokyo and Salt Lake City. Global Economics Paper No: 93 (South Africa Growth and Unemployment: A Ten-Year Outlook): Makes economic projections for South Africa for the next 10 years. Published on May 13, 2003. Global Economics Paper No: 99 (Dreaming With BRICs: The Path to 2050): Introduced the BRIC concept, which became highly popularized in the media and in economic research from this point on. Also made economic projections for 2050 for the G7 and South Africa as well. These were the first long-term economic projections covering the GDP of numerous countries. Published on October 1, 2003. Global Economics Paper No: 134 (How Solid are the BRICs): Introduced the Next Eleven concept. Published on December 1, 2005. Global Economics Paper No: 173 (New EU Member States - A Fifth BRIC? ): Makes 2050 economic projections for the new EU member states as a whole. Published on September 26, 2008. Global Economics Paper No: 188 (A United Korea; Reassessing North Korea Risks (Part I)): Makes 2050 economic projections for North Korea in the hypothetical event that North Korea makes large free-market reforms right now. Published on September 21, 2009. The Olympics and Economics 2012: Makes projections for the number of gold medals and told Olympic medals that each country wins at the 2012 Olympics using economic data and previous Olympic data. Published in 2012. ^ a b c d e f g "Goldman Sachs, Annual Report, 2018". ^ "The Goldman Sachs Group, Inc. 2018 Form 10-Q Quarterly Report for the Period Ended March 31, 2018" (PDF). U.S. Securities and Exchange Commission. ^ "Top investment banks 2017". Statista. Retrieved 2018-03-29. ^ "Like everyone else, Goldman was in trouble". The Economist. July 28, 2009. ^ "How Goldman secretly bet on the U.S. housing crash". McClatchy. November 1, 2009. ^ "Goldman Sachs to return $10B of bailout money". USA Today. April 15, 2009. ^ "JPMorgan and 9 Other Banks Repay TARP Money". The New York Times. June 17, 2009. ^ "Fortune 500 Companies: Goldman Sachs". Fortune. ^ Spiro, Leah Nathans; Reed, Stanley (December 22, 1997). "Inside the Money Machine-In a big-is-all business, Goldman vows to go it alone". Bloomberg L.P.
^ "Business & Finance: Cash & Comeback". Time. November 9, 1936. (Subscription required (help)). ^ Endlich, Lisa (1999). Goldman Sachs: The Culture Of Success. New York: A.A. Knopf. p. 34. ISBN 978-0-679-45080-1. ^ a b c d e f g h i j k l m n William D. Cohan (2012). Money and Power: How Goldman Sachs Came to Rule the World. Penguin Random House. ISBN 978-0-241-95406-5. ^ "Goldman Sachs, the Good, the Bad, and the Ugly". Bloomberg.com. July 20, 2011. Retrieved August 1, 2017. ^ Endlich, Lisa (1999). Goldman Sachs: The Culture Of Success. New York: A.A. Knopf. p. 18. ISBN 978-0-679-45080-1. ^ Cohan, William D. (March 16, 2012). "Goldman Sachs's long history of duping its clients". Washington Post. ^ Giroux, Gary (December 9, 2013). Accounting Fraud: Maneuvering and Manipulation, Past and Present. Business Expert Press. ^ Bess Levin (October 18, 2012). "Why I Left Goldman Sachs, Chapter Three: "My Alleged Competition"". DealBreaker. ^ "Business Principles". The Goldman Sachs Group, Inc. Retrieved January 24, 2008. ^ RAMIREZ, ANTHONY (November 22, 1994). "Chairman of Goldman Will Retire". The New York Times. ^ Bradsher, Keith (March 2, 1994). "House Votes to Request Clinton Data on Mexico". The New York Times. ^ "Bolsa Admits 2 Foreign Firms". The New York Times. November 22, 1994. ^ HANSELL, SAUL (November 18, 1994). "Loan Arranged at Rockefeller Center". The New York Times. ^ "Rockefeller Center sold". CNN Money. December 22, 2000. ^ Sugawara, Sandra (December 22, 2000). "JAPAN'S $34,000-PER-SHARE QUESTION". Washington Post. ^ Burns, Greg (July 13, 1999). "Goldman Sachs Buys Hull Group". Chicago Tribune. ^ Kahn, Joseph (July 13, 1999). "Goldman Sachs to Acquire Electronic Trading Concern". The New York Times. ^ Spiro, Leah Nathans (May 17, 1999). "Goldman Sachs: How Public Is This IPO?". Bloomberg L.P.
^ "End of an era for Goldman". CNN Money. May 3, 1999. ^ McCleehan, Patrick (September 12, 2000). "Goldman Sachs to Acquire Top Firm on Trading Floors". The New York Times. ^ "The World Bank's First Internet Bond-From concept to reality" (Press release). The World Bank. January 25, 2000. ^ "GOLDMAN SACHS AND JBWERE AGREE ON AUSTRALIAN / NZ MERGER" (Press release). Goldman Sachs. March 27, 2003. ^ "Goldman Sachs Paper No.134 Relevant Emerging Markets" (PDF). .goldmansachs.com. Retrieved November 2, 2011. ^ Khan, Jasim Uddin (December 15, 2005). "Bangladesh on Goldman Sachs 'Next Eleven' list". The Daily Star. Retrieved January 17, 2007. ^ "Goldman's uneasy subprime short". Financial Times. ^ Subprime star Josh Birnbaum leaves Goldman. The Telegraph. ^ Clark, Andrew (December 21, 2007). "Success shines unwelcome spotlight on to Goldman Sachs". The Guardian. London. Retrieved September 12, 2013. ^ Sloan, Allan (October 16, 2007). "Goldman Sachs' House of Junk". Fortune. ^ Hall, Jessica (September 22, 2008). "Goldman Sachs to be regulated by Fed". Reuters. ^ Kollewe, Julia; Teather, David (September 22, 2008). "Wall Street in crisis: Mitsubishi to buy stake in Morgan Stanley". The Guardian. ^ Hilsenrath, Jon; Paletta, Damian; Lucchetti, Aaron (September 22, 2008). "Goldman, Morgan Scrap Wall Street Model, Become Banks in Bid to Ride Out Crisis". The Wall Street Journal. (Subscription required (help)). ^ a b "Berkshire Hathaway to Invest $5 billion in Goldman Sachs". U.S. Securities and Exchange Commission. September 23, 2008. ^ Sloan, Allan (October 16, 2007). "An Unsavory Slice of Subprime". The Washington Post. Retrieved May 3, 2010. ^ a b Grocer, Stephen (July 30, 2009). "Wall Street Compensation-'No Clear Rhyme or Reason'". The Wall Street Journal. (Subscription required (help)). ^ a b c Giannone, Joseph A.; Bansal, Paritosh (November 16, 2008). "Goldman CEO, 6 others forgo 2008 bonuses". Reuters. ^ "Goldman Sachs Pays $1.1 Billion to Redeem TARP Warrants: US Taxpayers Make 23 Percent Return" (Press release). Business Wire. July 22, 2009. "Goldman Sachs Pays $1.1 Billion to Redeem Warrants". CNBC. July 22, 2009. ^ Crippe, Alex (March 18, 2011). "Warren Buffett Gets an Unwanted Call from Goldman Sachs". CNBC. Retrieved February 15, 2013. ^ "Goldman Sachs gives top execs bonuses in stock". USA Today. Bloomberg News. December 10, 2009. ^ a b Craig, Susanne; Enrich, David; Sidel, Robin (January 12, 2010). "Banks Brace for Bonus Fury". The Wall Street Journal. (Subscription required (help)). ^ ""FRB: Press Release - Federal Reserve releases detailed information about transactions conducted to stabilize markets during the recent financial crisis". Federal Reserve. December 1, 2010". Federalreserve.gov. Retrieved November 2, 2011. ^ ""Primary Dealer Credit Facility (PDCF)". Federal Reserve. Retrieved December 3, 2010". Federalreserve.gov. Retrieved November 2, 2011. ^ ""Term Securities Lending Facility (TSLF) and TSLF Options Program (TOP)". Federal Reserve. Retrieved December 3, 2010". Federalreserve.gov. Retrieved November 2, 2011. ^ ""FRB: Regulatory Reform: Transaction Data". Federal Reserve. Retrieved December 3, 2010". Federalreserve.gov. October 11, 2011. Retrieved November 2, 2011. ^ BARR, ALISTAIR (June 17, 2009). "J.P. Morgan, Goldman Sachs, other banks repay TARP". MarketWatch. ^ "Goldman Sachs Reputation Tarnished". Financial Times. August 2, 2009. (Subscription required (help)). ^ CHESSELL, JAMES; AHMED, NABILA (April 8, 2011). "Goldman Sachs takes full control in $1bn buyout". The Australian. ^ LaCapra, Lauren Tara; Herbst-Bayliss, Svea (September 16, 2011). "Goldman to close Global Alpha fund after losses". Reuters. ^ Rappaport, Liz (September 16, 2011). "Goldman to Close Global Alpha Hedge Fund". The Wall Street Journal. (Subscription required (help)). ^ Carney, John (September 16, 2011). "How Goldman Sachs Lost One Of Its Crown Jewels, Global Alpha". CNBC. ^ "Goldman Sachs to Shut Its Global Alpha Hedge Fund". The New York Times. September 15, 2011. ^ "Goldman Sachs Asset Management to Acquire Stable Value Business from Deutsche Asset & Wealth Management". MarketWatch. September 25, 2013. ^ Burn, Katy (April 30, 2013). "Apple's Record Plunge Into Debt Pool". The Wall Street Journal. Retrieved April 7, 2014. (Subscription required (help)). ^ a b Mead, Charles; Gangar, Sarika (April 30, 2013). "Apple Raises $17 Billion in Record Corporate Bond Sale". Bloomberg News. ^ Massoudi, Arash; Alloway, Tracy (September 13, 2013). "Goldman Sachs wins prime role in Twitter IPO". Financial Times. (Subscription required (help)). Goldman has now scored one of the biggest tech prizes around. ^ Spears, Lee; Picker, Leslie (November 7, 2013). "Goldman-Led Twitter Underwriters Share $59.2 Million in IPO Fees". Bloomberg News. ^ "Grand Parkway Segments D-G". United States Department of Transportation. ^ Kelly, Ross (June 12, 2013). "Suncorp Sells 'Bad Bank' Loans to Goldman Sachs". The Wall Street Journal. (Subscription required (help)). ^ BENNET, MICHAEL (June 13, 2013). "Suncorp sells $1.6bn loan book to Goldman Sachs for $960m". The Australian. ^ Cohen, Brian (December 1, 2015). "Goldman Sachs Files Patent Application For Securities Settlement Using Cryptocurrencies". Bitcoin Magazine. ^ Tillier, Martin (May 5, 2015). "Goldman Sachs' 'Investment' in Bitcoin is Newsworthy But Is Significant". NASDAQ. ^ Moore, Michael J. (August 13, 2015). "Goldman Sachs to Acquire GE Capital Bank's on-line deposit platform". Bloomberg News. ^ Williams-Grut, Oscar (April 25, 2016). "Goldman Sachs is launching a bank account for ordinary people - not just the super rich". Business Insider. ^ Sweet, Ken (October 13, 2016). "Goldman Sachs launches personal loan service". Associated Press. U.S. News & World Report. ^ Moyer, Liz (March 14, 2016). "Goldman Sachs to Buy Honest Dollar, a Small Plan Start-Up". The New York Times. ^ Kurmanaev, Anatoly; Vyas, Kejal (May 28, 2017). "Goldman Sachs Bought Venezuela's State Oil Company's Bonds Last Week". The Wall Street Journal. (Subscription required (help)). ^ Resnick-Ault, Jessica (April 16, 2018). "Goldman Sachs bought a money-management app". Business Insider. Reuters. ^ a b "Company Overview (GS)". Reuters. Retrieved November 21, 2009. ^ "Goldman Sachs Closes GS Capital Partners V at $8.5 Billion" (Press release). Market Wired. April 13, 2005. ^ "Goldman Sachs Closes GS Capital Partners VI" (Press release). Business Wire. April 23, 2007. ^ Hoffman, Liz (July 21, 2016). "Goldman Sachs Raising Private-Equity Fund of $5 Billion to $8 Billion". The Wall Street Journal. (Subscription required (help)). ^ a b "Goldman Sachs: ENVIRONMENTAL, SOCIAL AND GOVERNANCE REPORT". Goldman Sachs. ^ Picker, Leslie (March 3, 2016). "Goldman Sachs Expands Philanthropic Fund to Younger Workers". The New York Times. (Subscription required (help)). ^ Kotch, Alex (February 19, 2019). "America's Biggest Charities Are Funneling Millions to Hate Groups From Anonymous Donors". Sludge. Retrieved February 22, 2019. ^ a b Hall, John (March 14, 2012). "Top Goldman executive quits over culture of 'toxic' greed". The Daily Telegraph. ^ a b Smith, Greg (March 14, 2012). "Why I Am Leaving Goldman Sachs". The New York Times. (Subscription required (help)). ^ Harper, Christine (February 6, 2013). "Goldman Sachs Shouldn't Work for Russia, Human Rights Group Says". Bloomberg L.P.
^ a b CRESWELL, JULIE; WHITE, BEN (October 17, 2008). "The guys from Government Sachs". The New York Times. (Subscription required (help)). ^ a b James, Frank, "Goldman Sachs Director Tied To Insider-Trading Scandal", NPR, April 23, 2010. Retrieved March 1, 2011. ^ a b c d e f g KOCIENIEWSKI, DAVID (July 20, 2013). "A Shuffle of Aluminum, but to Banks, Pure Gold". The New York Times. (Subscription required (help)). ^ "How does a company's CEO pay compare to its workers'? Now you can find out". ^ "How Your Pay Stacks Up With The CEO's". ^ "How to Track CEO-Worker Pay Ratios". ^ "The CEO-Employee Pay Ratio". ^ a b c d e "Goldman Settles With S.E.C. for $550 million". The New York Times. July 15, 2010. (Subscription required (help)). ^ a b c McLean and Nocera. All the Devils Are Here. p. 361. By the middle of the summer, Goldman Sachs was producing blowout profits, had repaid its $10 billion in TARP funds, and had already set aside $11.4 billion -- a record sum -- with which to pay bonuses to employees. ^ Salmon, Felix (June 11, 2010). "BP: Still not as evil as Goldman Sachs". Reuters. ^ Barr, Colin (July 14, 2009). "The return of the $773,000 paycheck". Fortune Magazine. ^ BOWLEY, GRAHAM (July 14, 2009). "With Big Profit, Goldman Sees Big Payday Ahead". The New York Times. ^ Touryalai, Halah (April 14, 2011). "Criminal Charges Loom For Goldman Sachs After Scathing Senate Report". Forbes Magazine. ^ Carney, John (July 16, 2009). "Matt Taibbi's "Vampire Squid" Takedown Of Goldman Sachs Is Finally Online". Business Insider. What's fascinating to us is how the spirit of Taibbi's piece, if not its details, has really caught on. Yesterday, the Wall Street Journal attacked Goldman Sachs as a heavily subsidized, implicitly guaranteed firm akin to Fannie Mae. They called it "Goldie Mac". The New York Times news report on the reaction to Goldman's earnings also didn't shy away from these sentiments. It said that Goldman's traders are known as the Bandits of Broad Street (which is clever, although we haven't heard that one before) and quoted an unnamed Wall Street who compared Goldman staff to "orcs" in the Lord of the Rings (which is even better). ^ a b Zamansky, Jake (August 8, 2013). "The Great Vampire Squid Keeps On Sucking". Forbes Magazine. ^ Roose, Kevin (December 13, 2011). "The Long Life of the Vampire Squid". The New York Times. ^ Inman, Phillip (June 20, 2009). "Goldman to make record bonus payout". The Guardian. ^ "Goldman Maintains It Had No A.I.G. Exposure". The New York Times. March 20, 2009. (Subscription required (help)). ^ van Praag, Lucas (April 14, 2009). "Goldman Protected Its Clients From AIG's Weakness". The Wall Street Journal. (Subscription required (help)). ^ Terry, Jordan (November 20, 2009). "The Media is Wrong about Goldman Sachs, AIG". The Atlantic. ^ Weisenthal, Joe (April 14, 2009). "Goldman CFO Doesn't Get Why Everyone Is So Obsessed With AIG". Business Insider. ^ "Another Dishonest NYT Editorial on AIG", Economics of Contempt (blog). Retrieved April 29, 2009. ^ Pittman, Mark (September 29, 2008). "Goldman, Merrill Collect Billions After Fed's AIG Bailout Loans". Bloomberg L.P. Bernie Sanders. ^ Morcroft, Greg; Barr, Alistair (March 20, 2009). "Goldman rejected settling of AIG trades at discount". Marketwatch. ^ Matt Taibbi. Griftopia. Spiegel & Grau, 2010. p. 248. ISBN 978-0-385-52995-2. ^ Andrews, Edmund L. (September 16, 2008). "Fed's $85 Billion Loan Rescues Insurer". The New York Times. ^ McLaughlin, Tim (January 23, 2013). "Goldman cleared of all charges in doomed Dragon sale". Reuters. ^ Nocera, Joe (March 9, 2013). "Rigging the I.P.O. Game". The New York Times. (Subscription required (help)). ^ Salmon, Felix (March 11, 2013). "Where banks really make money on IPOs". Reuters. ^ "Offshore Shell Games 2016". Archived from the original on February 2, 2017. Retrieved March 26, 2017. ^ White, Ben (December 16, 2008). "Goldman Sachs Reports $2.1 Billion Quarterly Loss". The New York Times. ^ "The Nation: "8 Corporations That Owe You Money"". February 3, 2011. ^ Balzli, Beat (February 8, 2010). "How Goldman Sachs Helped Greece to Mask its True Debt". Der Spiegel. Retrieved July 1, 2011. ^ Aversa, Jeannine (February 25, 2010). "Fed chief: We're looking into firms betting on Greek default". USA Today. ^ Castle, Stephen; Kitsantonis, Niki (June 19, 2011). "Deal on Lifeline to Avert Greek Bankruptcy Is Postponed". The New York Times. (Subscription required (help)). ^ a b c d e f g Foley, Stephen (November 18, 2011). "What price the new democracy? Goldman Sachs conquers Europe". The Independent. ^ Collins, Stephen (May 20, 2015). "Goldman Sachs chairman Peter Sutherland retires". Irish Times. ^ Schumpeter, Joseph (March 14, 2012). "A noisy exit". The Economist. ^ "Of Mammon and muppets". The Economist. October 27, 2012. ^ a b Stewart, James B. (October 19, 2012). "A Tell-All on Goldman Has Little Worth Telling". The New York Times. (Subscription required (help)). ^ Holiday, Ryan (October 26, 2012). "The Making (and Unmaking) of Goldman Sachs Whistleblower Greg Smith". The Observer. "Why I Left Goldman Sachs: Is the bank's most famous quitter a con man?". The Week. October 19, 2012. ^ Mandis, Steven G. (October 1, 2013). "What Happened to Goldman Sachs: An Insider's Story of Organizational Drift and Its Unintended Consequences". Harvard Business Review. ^ Brady, Diane (September 25, 2013). "Goldman Sachs Insider Tale Doubles as PhD Thesis". Bloomberg News. ^ a b Lattman, Peter (September 30, 2013). "An Ex-Trader, Now a Sociologist, Looks at the Changes in Goldman". The New York Times. (Subscription required (help)). ^ Solomon, Jesse (July 2, 2014). "Suit alleges "boy club" culture at Goldman". CNN. Kolhatkar, Sheelah (July 2, 2014). "A Lawsuit Peeks Inside the Goldman Sachs 'Boys' Club'". Bloomberg News. McSherry, Mark (July 3, 2014). "Goldman Sachs lawsuit: Wall Street giant is a 'boys club where drinking, strip clubs and sexism tolerated'". The Independent. ^ "U.S. judge certifies Goldman Sachs gender bias class action". Reuters. 2018-03-31. Retrieved 2019-02-23. ^ Coutts, Sharona; Lifsher, Marc; Hiltzik, Michael A. (November 11, 2008). "Firm urged hedge against state bonds it helped sell". Los Angeles Times. ^ Gordon, Greg (October 27, 2009). "Why did blue-chip Goldman take a walk on subprime's wild side?". Alaska Dispatch News. ^ McArdle, Megan (July 10, 2009). "Matt Taibbi Gets His Sarah Palin On". The Atlantic. ^ ROOD, JUSTIN; SCHWARTZ, EMMA (January 27, 2009). "Another Lobbyist Headed Into Obama Administration". ABC News. ^ Carney, Timothy P. (February 23, 2011). "Obama's top funder also leads the nation in White House visits". Washington Examiner. ^ Worthy, Ford S.; Brett Duval Fromson; Lorraine Carson (December 22, 1986). "Wall Street's Spreading Scandal". Fortune Magazine. Cable News Network LP, LLLP. A Time Warner Company. Retrieved January 17, 2007. ^ Thomas, Landon Jr. (February 18, 2002). "Cold Call". New York Magazine. Retrieved January 17, 2007. ^ McCool, Grant (February 10, 2011). "Judge postpones Rajaratnam trial to March 8". Reuters. ^ Hurtado, Patricia; Glovin, David; Dolmetsch, Chris (November 11, 2014). "Ex-Goldman Director Gupta Indicted in Probe of Rajaratnam Trades". Bloomberg News. (Subscription required (help)). ^ Tangel, Andrew (October 24, 2012). "Rajat Gupta, former Goldman Sachs director, is sentenced". Los Angeles Times. ^ Morgenson, Gretchen; Story, Louise (December 23, 2009). "Banks Bundled Bad Debt, Bet Against It and Won". The New York Times. (Subscription required (help)). ^ McLean and Nocera. All the Devils Are Here. p. 271. ^ Morgenson, Gretchen; Story, Louise (April 16, 2010). "S.E.C. Sues Goldman Over Fraud in Housing Deal". The New York Times. (Subscription required (help)). ^ Shenn, Jody; Ivry, Bob (April 16, 2010). "Abacus Let Goldman Shuffle Mortgage Risk Like Beads". Sydney Morning Herald. Bloomberg News. ^ Bethany McLean; Joe Nocera. All the Devils Are Here: The Hidden History of the Financial Crisis. p. 274. The CDO had been constructed, Goldman executives later told the Senate Permanent Subcommittee, while the company was trying to remove triple-B assets from its books. Among those assets was a long position in the ABX index that Goldman had gotten 'stuck' with while putting together deals for hedge fund clients that wanted to go short. Unable to find counterparties to take the long position off its hands, Goldman used Hudson as a means by which it hedged its long position. ... None of which was clear from the Hudson prospectus. Instead, the disclosure merely said that the CDO's contents were 'assets sourced from the Street', making it sound as though Goldman randomly selected the securities, instead of specifically creating a hedge for its won book. ^ Bethany McLean; Joe Nocera. All the Devils Are Here: The Hidden History of the Financial Crisis. p. 274. ^ a b Lucchetti, Aaron; Ng, Serena (April 20, 2010). "Abacus Deal: As Bad as They Come". The Wall Street Journal. ^ a b c Whalen, Philip; Tan Bhala, Kara. "Goldman Sachs and The ABACUS Deal". Seven Pillars Institute. ^ a b Wilchins, Dan (April 16, 2010). "Factbox: How Goldman's ABACUS deal worked". April 16, 2010. Reuters. Retrieved February 9, 2014. Hedge fund manager John Paulson tells Goldman Sachs in late 2006 he wants to bet against risky subprime mortgages using derivatives. The risky mortgage bonds that Paulson wanted to short were essentially subprime home loans that had been repackaged into bonds. The bonds were rated "BBB", meaning that as the home loans defaulted, these bonds would be among the first to feel the pain. ^ The $15 million has been described as "rent" for the Abacus name. Bethany McLean; Joe Nocera. All the Devils Are Here: The Hidden History of the Financial Crisis. p. 279. Paulson knocked on Goldman's door at a fortuitous moment. The firm had begun thinking about 'ABACUS-renal strategies' ... By that, he meant that Goldman would 'rent' - for a hefty fee - the Abacus brand to a hedge fund that wanted to make a massive short bet. ... Paulson paid Goldman $15 million to rent the Abacus name. ^ "Goldman's misleading statement on ACA". Reuters. April 19, 2010. when Goldman wrapped the super-senior tranche of the Abacus deal, it did so with ABN Amro, a too-big-to-fail bank, and not with ACA. ABN Amro then laid off that risk onto ACA, but was on the hook for all of it if ACA went bust. As, of course, it did. ^ a b c "Securities and Exchange Commission vs Goldman Sachs & Co & Fabrice Tourre, Complaint (Securities Fraud)" (PDF). U.S. Securities and Exchange Commission. April 16, 2010. Retrieved April 17, 2010. ^ THOMAS Jr., LANDON (April 22, 2010). "A Routine Deal Became an $840 Million Mistake". The New York Times. (Subscription required (help)). R.B.S. [Royal Bank of Scotland] became involved in Abacus almost by accident. Bankers working in London for ABN Amro, a Dutch bank that was later acquired by R.B.S., agreed to stand behind a portfolio of American mortgage investments that were used in the deal. ABN Amro shouldered almost all of the risks for what, in retrospect, might seem like a small reward: that $7 million. When the housing market fell and Abacus collapsed, R.B.S. ended up on the hook for most of the losses. ^ "SEC Charges Goldman Sachs With Fraud in Structuring and Marketing of CDO Tied to Subprime Mortgages" (Press release). U.S. Securities and Exchange Commission. April 16, 2010. ^ a b c "Goldman Sachs Makes Further Comments on SEC Complaint" (Press release). Business Wire. April 16, 2010. ^ Corkery, Michael (April 19, 2010). "Goldman Responds Again to SEC Complaint". The Wall Street Journal. (Subscription required (help)). ^ Salmon, Felix (April 19, 2010). "Goldman's misleading statement on ACA". Reuters. ^ Maguire, Tom (April 21, 2010). "CNBC On The Goldman Complaint - This Is Surreal". Justoneminute.typepad.com. ^ Pitt, Harvey (April 20, 2010). "The SEC's Dangerous Gamble". The Daily Beast. ^ "Goldman in the Eye of the Beholder". The Atlantic. October 29, 2011. ^ Jones, Ashby (April 19, 2010). "Goldman v. SEC: It's All About Materiality". The Wall Street Journal. (Subscription required (help)). ^ Fiderer, David (May 25, 2011). "The Moral Compass Missing From The Greatest Trade Ever". The Huffington Post. ^ Zuckerman, Gregory (April 19, 2010). "Inside Paulson's Deal with Goldman". Daily Beast. Retrieved February 6, 2014. Scott Eichel, a senior Bear Stearns trader, was among those at the investment bank who sat through a meeting with Paulson but later turned down the idea. He worried that Paulson would want especially ugly mortgages for the CDOs, like a bettor asking a football owner to bench a star quarterback to improve the odds of his wager against the team. Either way, he felt it would look improper. ... it didn't pass the ethics standards; it was a reputation issue, and it didn't pass our moral compass. ^ a b "The Goldman case: Legal or illegal, the Abacus deal was morally wrong. Wall Street needs a new compass". Houston Chronicle. April 22, 2010. ^ Raymond, Nate (August 1, 2013). "SEC wins as ex-Goldman executive Tourre found liable for fraud". Reuters. ^ a b Craig, Susanne; Protess, Ben (August 1, 2013). "Former Goldman Trader Is Found Liable in Mortgage Deal". The New York Times. ^ Stempel, Jonathan (September 30, 2010). "Goldman's Tourre says SEC suit should be dismissed". Reuters. Bray, Chad (September 29, 2010). "Goldman Trader Seeks Suit Dismissal". The Wall Street Journal. (Subscription required (help)). Koppel, Nathan; Jones, Ashby (September 28, 2010). "Securities Ruling Limits Claims of Fraud". The Wall Street Journal. (Subscription required (help)). ElBoghdady, Dina (July 30, 2013). "Jurors hear closing arguments in SEC fraud case against Fabrice Tourre". The Washington Post. ^ a b Taibbi, Matt (February 12, 2014). "The Vampire Squid Strikes Again: The Mega Banks' Most Devious Scam Yet". Rolling Stone. Retrieved February 14, 2014. ^ Abrams, Rachel (December 6, 2013). "Ex-Goldman Trader Sentenced to 9 Months in Prison". The New York Times. ^ Kaufman, Frederick (July 1, 2010). "The Food Bubble: How Wall Street Starved Millions and got away with it" (PDF). Harper's Magazine. ^ Goodman, Amy; Gonzales, Juan; Kaufman, Frederick (July 16, 2010). "The Food Bubble: How Wall Street Starved Millions and Got Away With It". Democracy Now!. ^ Jay, Paul (May 6, 2010). "Global Food Bubble? (interview with Jayati Ghosh)" (PDF). Atlantic Free Press. ^ Buttonwood (June 24, 2010). "Clearing the usual suspects". The Economist. (Subscription required (help)). ^ Stanley, Marcus (July 24, 2013). "The Goldman Sachs Guide To Manipulating Commodities". U.S. News & World Report. ^ Kocieniewski, David (August 12, 2013). "U.S. Subpoenas Goldman in Inquiry of Aluminum Warehouses". The New York Times. (Subscription required (help)). ^ a b Harris, Andrew (December 16, 2013). "Goldman Sachs Aluminum Antitrust Suits Shipped to NYC". Bloomberg L.P.
^ a b DePillis, Lydia (July 22, 2013). "Here's how Goldman Sachs is making your beer more expensive". The Washington Post. ^ Levine, Matt (November 20, 2014). "The Goldman Sachs Aluminum Conspiracy Was Pretty Silly". Bloomberg News. ^ Berthelsen, Christian; Iosebashvili, Ira (December 22, 2014). "Goldman Sachs Sells Aluminum Business to Swiss Firm". The Wall Street Journal. (Subscription required (help)). ^ Lef, Jonathan; Mason, Josephine; LaCapra, Lauren Tara (December 22, 2014). "Goldman sells Metro metals warehouse unit to Reuben Bros". Reuters. ^ POPPER, NATHANIEL (December 22, 2014). "Goldman Sells Aluminum Subsidiary". The New York Times. (Subscription required (help)). ^ a b Sheppard, Kate (September 8, 2011). "$4 Gas: Brought to You by Wall Street". Mother Jones. ^ a b "Big Banks Bet Crude Oil Prices Would Fall in 2008 Run-Up, Leaked Data Show". Bloomberg L.P. Just before crude oil hit its record high in mid-2008, 15 of the world's largest banks were betting that prices would fall, according to private trading data released by U.S. Senator Bernie Sanders. The net positions of the banks undermine arguments made by Sanders that speculative trades on Wall Street drove oil prices in 2008, said Craig Pirrong, director of the Global Energy Management Institute at the University of Houston. Retail gasoline reached a record $4.08 a gallon on July 7, 2008, and oil peaked at $147.27 a barrel on July 11 that year. ^ a b Johnson, Brad (April 13, 2011). "Goldman Sachs Admits Record Speculation To Blame For Skyrocketing Gas Prices". ThinkProgress. ^ a b Sherter, Alain (April 13, 2011). "When Goldman Sachs Warns That Speculation Drives Oil Prices, Listen Up". CBS News. ^ a b c KENNEDY II, JOSEPH P. (April 10, 2012). "The High Cost of Gambling on Oil". The New York Times. ^ Frangoul, Anmar (2017-10-02). "Dong Energy changes name to Orsted goes big on renewables". www.cnbc.com. Retrieved 2019-04-12. ^ a b c Levring, Peter; Wienberg, Christian (February 6, 2014). "In Denmark, Goldman Sachs Deal Ignites Political Crisis". Bloomberg L.P.
^ Levring, Peter (February 5, 2017). "Goldman Sale Reignites Conspiracy Theories in Danish Parliament". Bloomberg L.P.
^ a b Hodges, Jeremy (August 19, 2014). "Goldman Sachs Drops Bid to End Libyan Wealth Fund Suit". Bloomberg News. ^ Fontevecchia, Agustino (May 31, 2011). "Goldman Sachs Lost 98% of Libya's $1.3B Sovereign Wealth Fund Investment". Forbes. ^ ANDERSON, JENNY (January 30, 2014). "Libyan Investment Fund Sues Goldman Over Loss". The New York Times. (Subscription required (help)). ^ Rankin, Jennifer (November 24, 2014). "High court judge orders Goldman Sachs to disclose Libya profits". The Guardian. ^ "Goldman admits cultivating ties with Gaddafi-era Libya fund". Financial Times. September 19, 2014. (Subscription required (help)). ^ Barlyn, Suzanne (January 14, 2016). "Goldman Sachs to pay $15 million to settle SEC stock lending case". Reuters. ^ "Deutsche Bank hires Goldman Sachs's Malaysia head". Reuters. January 6, 2014. ^ Farrell, Greg; Geiger, Keri (May 18, 2016). "Goldman's Leissner Said to Get Money From Ex-1MDB Employee". Bloomberg L.P.
^ Baer, Justin; Wright, Tom; Hope, Bradley (June 6, 2016). "Goldman Probed Over Malaysia Fund 1MDB". The Wall Street Journal. (Subscription required (help)). ^ "Goldman Sachs Tumbles on 1MDB Scandal and 'Fear of the Unknown'". www.bloomberg.com. Retrieved 2018-11-14. ^ "1MDB: How did Leissner and other execs bypass Goldman's compliance rules? - Nation | The Star Online". www.thestar.com.my. Retrieved 2018-11-14. ^ Geddie, John. "Goldman Sachs CEO: I feel horrible ex-bankers broke law in 1MDB case". U.S. Retrieved 2018-11-08. ^ "Goldman Sachs CEO: I feel horrible ex-bankers broke law in 1MDB case - Nation | The Star Online". www.thestar.com.my. Retrieved 2018-11-08. ^ "Goldman CEO apologises for Leissner's role in 1MDB scandal". The Edge Markets. 2019-01-18. Retrieved 2019-01-18. ^ "Goldman Sachs CEO apologises for ex-banker's role in 1MDB scandal - Nation | The Star Online". www.thestar.com.my. Retrieved 2019-01-18. ^ "Malaysia files charges against Goldman over 1MDB scandal". www.thesundaily.my. Retrieved 2018-12-17. ^ "AGC files criminal charges against subsidiaries of Goldman Sachs and employees - Nation | The Star Online". www.thestar.com.my. Retrieved 2018-12-17. ^ Goldman Sachs: Profile for 2014 Election Cycle, Center for Responsive Politics. ^ a b c d e Gillespie, Patrick (September 6, 2016). "Goldman Sachs' top 1% employees can't donate to Trump". CNN Money. Retrieved September 7, 2016. ^ a b c Sara Sjolin, Why Goldman Sachs staff can donate to Hillary Clinton but not Donald Trump, MarketWatch (September 7, 2016). ^ "100 Best Companies to Work". Fortune. ^ "Goldman Sachs Group - Best Companies to Work". ^ Shen, Lucinda (April 19, 2016). "Goldman Sachs Employees Have Gotten a Huge Pay Cut". Fortune Magazine. ^ Gavin, Robert (December 12, 2006). "Good deal: Average Goldman Sachs employee makes $622,000". Boston Globe. Retrieved January 17, 2007. ^ Peter Coy (April 16, 2013). "At Goldman, the Average Pay for Three Months Is $135,594". Bloomberg Businessweek. ^ "Please, Sir, I want Some More". New York Magazine. December 5, 2005. Retrieved August 24, 2007. ^ Gerdes, Lindsey (September 4, 2008). "Best Places to Launch a Career 2008". Bloomberg Businessweek. ^ Harper, Christine (December 21, 2007). "Goldman Awards Blankfein a Record $67.9 million Bonus". Bloomberg. Retrieved December 21, 2007. ^ "Goldman Sachs cuts staff in annual review process". Reuters. March 19, 2012. ^ "Goldman Names a New Chief. Don't Expect Big Changes". Retrieved 2018-07-18. ^ "Google Drive Viewer". Docs.google.com. Retrieved June 23, 2013. Clinton, Hillary (2016). The Goldman Sachs Speeches. With an introduction by Julian Assange and annotations by Doug Henwood. New York: OR Books. ISBN 978-1-682190-85-2. McGee, Suzanne (2010). Chasing Goldman Sachs: How the Masters of the Universe Melted Wall Street Down ... And Why They'll Take Us to the Brink Again. New York: Crown Business. ISBN 0-307-46011-8. Brenner, Robert (2009). What is Good for Goldman Sachs is Good for America - The Origins of the Present Crisis. Center for Social Theory and Comparative History. UCLA. Ellis, Charles D. (2008). The Partnership: The Making of Goldman Sachs. New York: The Penguin Press HC. ISBN 1-59420-189-7. Vault (2006). Vault employer profile. Goldman Sachs. New York: Vault, Inc. ISBN 1-58131-469-8. WetFeet (2004). The Goldman Sachs Group. San Francisco, CA: WetFeet. ISBN 1-58207-450-X. Endlich, Lisa (1999). Goldman Sachs: The Culture Of Success. New York: A.A. Knopf. ISBN 0-679-45080-7. Lindskoog, Nils (1998). Long-Term Greedy: The Triumph of Goldman Sachs. Appleton, WI: McCrossen Pub. ISBN 0-9652153-3-4. Wikimedia Commons has media related to Goldman Sachs.